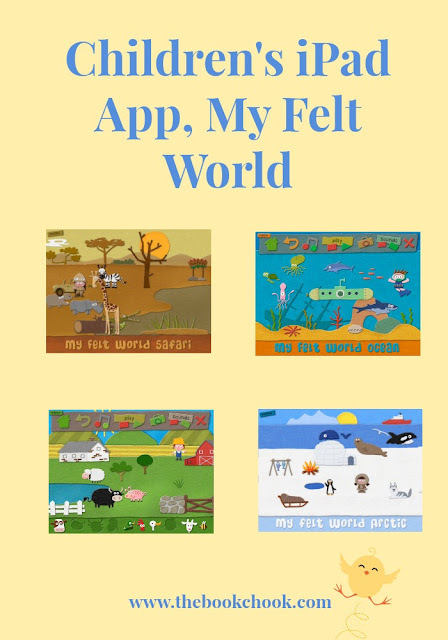 My Felt World is an app by developer, Digital Playbox. It is described as “an interactive animated playset.” I love that kids can create scenes with it, and that oral stories and discussion automatically and naturally flow from this activity. Let your child's imagination take them all over the world! My Felt World uses the soft familiar texture of felt fabrics to create four animated adventures. Feed the animals on the farm! Swim with fish in the ocean! Go on safari or wrap up warm at the North Pole! My Felt World is accompanied by original music and atmospheric sound effects. Each scene has a set of lovable felt characters that come to life when touched or moved. Double tap them for surprise extras! Scroll the background with a touch of the screen. Learn a thing or two from the Fun Facts page within each scene. Take a picture of your child's latest adventure and save it to the iPad Photos folder - ready to share with friends and family. I road-tested this app with a delighted three-year-old who loved talking about what she was doing with the felt stickers, and naturally put her finger on one to jiggle it a little while she supplied its voice. We tried all sorts of unusual image making - a snake for a hat, or all the animals frolicking in the water. We had the best fun playing together, and it reminded me all over again how much more worthwhile an app can be when we play and talk WITH our kids. At time of writing this review, the app is $Au1.49 which in my book makes it perfect for kids 3-5 with iPads at home, or in an educational situation.